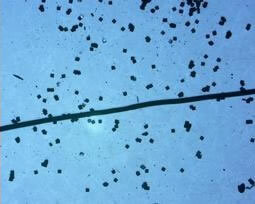 The world's smallest and thinnest RFID tags were introduced yesterday by Hitachi. Tiny miracles of miniaturization, these RFID chips (Radio Frequency IDentification chips) measure just 0.05 x 0.05 millimeters. The previous record-holder, the Hitachi mu-chip, is just 0.4 x 0.4 millimeters. 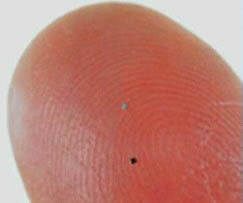 Take a look at the size of the mu-chip RFID tag on a human fingertip. Now, compare that with the new RFID tags. The "powder type" tags are some sixty times smaller. The new RFID chips have a 128-bit ROM for storing a unique 38 digit number, like their predecessor. Hitachi used semiconductor miniaturization technology and electron beams to write data on the chip substrates to achieve the new, smaller size. Hitachi's mu-chips are already in production; they were used to prevent ticket forgery at last year's Aichi international technology exposition. RFID 'powder,' on the other hand, is so much smaller that it can easily be incorporated into thin paper, like that used in paper currency and gift certificates. These tiny RFID tags could be worked into any product; combined with RFID readers built into doorways, theft of consumer goods would be practically impossible. It's not clear from the references provided, but even if this chip needs an external antenna, the attached antenna would be a tiny ribbon of wire more narrow than a human hair and only a fraction of an inch long. How far away could you be, and still read the information from this "powder RFID?" The source article is very thin; however, the mu-chip mentioned earlier is readable from a distance of 25 centimeters (about ten inches) with an external antenna like the one mentioned in the preceding paragraph. This doesn't sound like much, but it's certainly enough to read people going through doorways, for example. These devices could also be used to identify and track people. For example, suppose you participated in some sort of protest or other organized activity. If police agencies sprinkled these tags around, every individual could be tracked and later identified at leisure, with powerful enough tag scanners. Take a look at these earlier stories related to RFID, and consider how much easier it will be with tinier chips: RFID Sensor Tag Shower For Disasters (gentle rain of RFID), RFID-Maki: Easy Payment Sushi (just tag the sushi directly, then scan customer's stomach [no joke, see digestible tags]) and VeriChip Chairman Proposes RFID Chips For Immigrants (just dust the border). Via Pink Tentacle. Also, read more about the mu-chip.